Twenty years after Nintendo's biggest franchise was born, the Mario Bros. return in a dazzling, all-new platformer sure to set players' fingers twitching. Fans from Mario's classic days will see their dreams answered in this return to the Mushroom Kingdom, while a new generation of Mario" players will learn what true platforming greatness means. Special powers/weapons/moves/features: Mario and Luigi can do all kinds of jump manoeuvres: increasingly high triple jumps, wall jumps and high bounces off enemies. 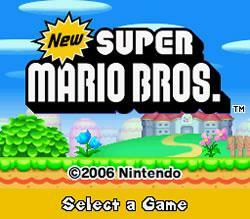 Mario also can use power-ups like Mushrooms (grow big), Fire Flowers (throw fireballs), Starmen (become invincible), Blue Shells (turn into a speedy, blue Koopa shell) and other mushrooms that make him tiny or huge.